SANTIAGO, Mar 13 2013 (IPS) - Three indigenous communities from the Chilean highlands have just received solar panels, which will be set up and maintained by unlikely solar engineers: five native women who travelled halfway around the world to India and overcame language and other barriers to bring photovoltaic energy to their villages. Luisa and Liliana Terán are cousins from Caspana, an Atacameña indigenous community; Elena Achú and Elvira Urrelo are from the Quechua village of Ollagüe; and Nicolasa Yufla is an Aymara Indian from Toconce. The three villages, with a combined population of 1,000, are in the Atacama desert. Water is scarce and there is no electricity in their villages, located more than 3,000 metres above sea level in the Chilean altiplano, near the Bolivian border. “We get power from a generator for just two and a half hours late in the evening,” Luisa Terán, an artisan, told IPS. Last year, the five women travelled to the village of Tilonia in the northwestern Indian state of Rajasthan, which is home to the Barefoot College. The College has been working since 1972 to improve the lives of the rural poor by addressing basic needs for water, electricity, housing, health, education and income. It is now training poor, rural women from Africa, Asia and Latin America as solar engineers, to bring solar lighting to remote inaccessible villages off the energy grid. For six months, the five Chilean villagers received hands-on training at the College in fabricating, installing and maintaining solar lighting systems. “An ad reached us that said they were looking for women between the ages of 35 and 40 to receive training in India. I was interested from the start, but when they told me it would be for six months, I was hesitant, because that was a long time to be so far away from the family,” Terán said. Encouraged by her sister, who took care of her two daughters, and her mother, she decided to make the journey. But she left the village without telling anyone else where she was going. Now that the solar panels have arrived, she’s afraid that she has forgotten what she learned, after six months without being able to apply her knowledge. “I knew what I was there for, but it still took me three months to adapt, mainly to the food and the incredible heat,” she said. The five women left on Mar. 15, 2012, as part of an initiative organised by the Barefoot College, Chile’s National Women’s Service (SERNAM), the Regional Secretariat of the Energy Ministry, and the Italian company Enel Green Power, which donated the equipment. The three solar kits that arrived in the villages this month each include a 12-volt panel, a 12-volt battery bank, a 4-Amp LED light, and an 8-Amp charge controller. So far, 700 women from 49 countries in Asia, Africa and Latin America have taken the course to become “barefoot solar engineers”. In that capacity, they are responsible for installing, repairing and providing maintenance for solar lighting units in the households of their villages, for a minimum of five years. They are also expected to set up a rural electronic workshop to store the necessary components, which functions as a mini-electric plant with a potential of 320 watts per hour. Thanks to this and other Barefoot solar initiatives, 450,000 people in remote villages in different regions now have light, and the carbon emissions caused by burning fuel and firewood have been reduced by 13 metric tonnes a day. In Latin America, the aim is to bring light to 1,000 homes. In Chile, “it is very important for communities to learn about our potential for the development of renewable energies, and solar energy projects in particular,” Carlos Arenas, the regional energy ministry secretary for the Macro Zona Norte in northern Chile, told IPS. The northern region has vast potential, especially the Atacama desert, which has one of the highest solar radiation levels worldwide, according to studies by the University of Chile: between 7 and 7.5 kwh per square metre. In fact, solar panels covering an area of 400 square km could fully meet the country’s energy needs, experts say. But most of the demand in the north comes from the mining industry, which absorbs 90 percent of the energy produced, while the remaining 10 percent goes towards household, commercial and public use. For that reason, “we supported this initiative…an enriching experience for the people who live in such remote villages and who lack a steady energy supply, and in some cases pay a high cost for energy,” he added. 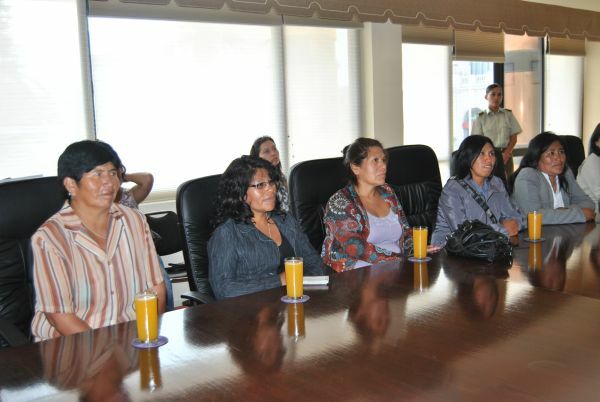 When the five Chilean women reached India, they found out that the course was in English. It was difficult for them to understand the instructors, Terán said, but in the end they managed to communicate through signs, gestures and drawings. They also found themselves in a place radically different from their villages. “There were many bugs, lizards and other animals. We slept on mats on hard wooden beds. And the poverty there was terrible,” she said. In the group, there were also five indigenous women from Peru “who were sad, and cried a lot,” she said. But now, those Peruvian mothers and grandmothers have brought solar lighting to the households in the village of Japopunco, 4,800 metres above sea level, Terán added. “These are women with skills, but they live in remote places, which means it was an incredible personal experience for them,” Paola Diez, the director of the SERNAM department of women and work, told IPS. Her office and Chile’s national indigenous development agency, CONADI, are implementing a plan to train native women around the country in sustainable enterprises, helping to pull them out of a subsistence economy. The initiative is aimed at boosting women’s insertion in the labour market in Chile, where 47.7 percent of women work, and the government wants to bump that up to 50 percent. Terán is ready to put her newfound knowledge to use in Caspana. “The idea is to start by bringing light to the houses, and maybe later we could install a refrigerator, which everyone wants,” she said. “We also want to share our training, but we need help to start making and selling solar lamps. And people want us to teach them, so that the women themselves will know how to install solar lighting in their homes,” she added. Do you know if in this initiative has also Mexico been involved? Ironic that Native Americans going to a country that are full of people that Columbus mistook them as. I laughed at thr Aymara “Indian” in “India” part of the story.